Pratt in Venice classes generally do not conflict. Students are welcome to come to any classes, including all museum lectures, and most special on-site classes. 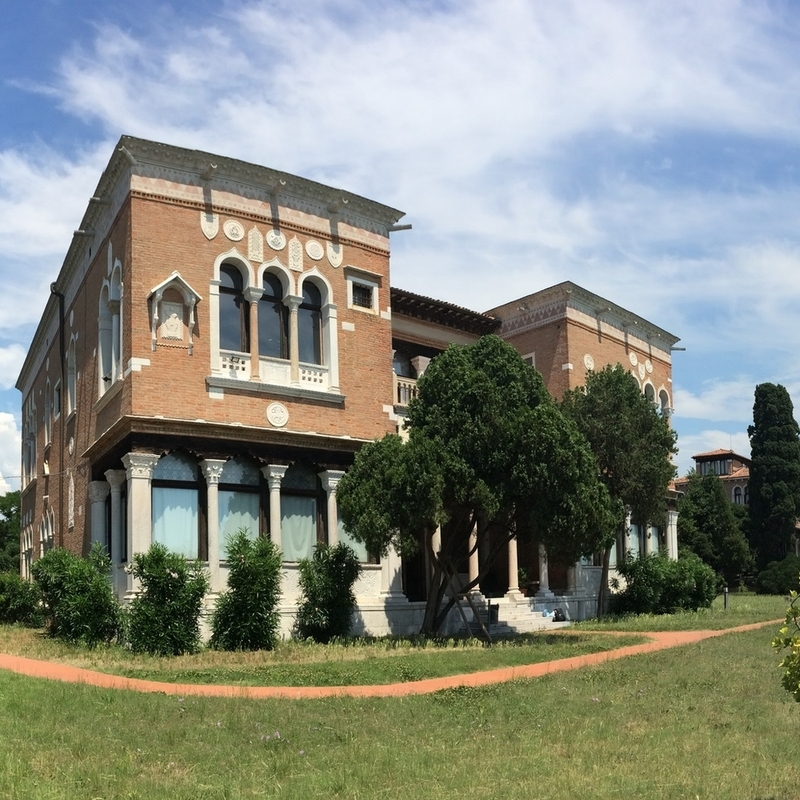 At the Villa Heriot on the Giudecca (Zitelle stop on the vaporetto); this is our main site for classes. Painting meets here, as do Art History and Materials & Techniques when not on site. The Pratt in Venice library is housed here. The Italian classes are held at UIA after the studio or Art History classes. The printmaking/drawing class is held here, and it is located near the Grand Canal close to the San Marcuola vaporetto stop. Diana Bowers (PiV '13) at work on the woodblock printing press at Scuola di Grafica (photo: Joseph Kopta). The online catalogue for 43 libraries in Venice is OPAC and is searchable online. Library holdings since 1990 have been catalogued in the online database; individual libraries will have print cards and catalogues listing their holdings acquired before then. Search for materials at http://polovea.sebina.it/SebinaOpac/Opac. This is a modest collection of books for Pratt students which has been built up since the inception of the program in 1984. It includes basic references in English on Venetian art and specialized books on materials and techniques in both English and Italian. These books, which may be borrowed for short periods of time, are to be considered a starting point for research. Hours are the same as UIA; holdings are not listed in OPAC. Available to all students. It’s usually open weekdays and Saturday mornings. Instructions for use will be provided. It has excellent references on the history and art of Venice and has all Italian and English language resources. Passport required to register for a reader's card; registration office is usually only open in the morning. Staff speaks Italian. Near Santa Maria Formosa. This library contains basic information on Venetian art and architecture, and is useful since it was founded specifically for student use. It is open during the evening and on Sunday and provides internet access. Passport required to register for a reader's card. Staff speaks Italian; select staff speak English. On the island of San Giorgio Maggiore (part of the Old Benedictine Monastery). It is a specialized art historical library which has most of the technical journals. Students taking Materials and Techniques will be introduced to the library and staff during their second class session. The Cini has hours from 9am- 6pm, Monday through Friday. Staff speaks Italian; select staff speak English. This also is a specialized art history library in Piazza San Marco. You need to bring your passport if you wish to get a library card. Staff speaks Italian. While these are the libraries that are most useful, there are others that have specialized topics, such as architecture, costume and glass. Students will be introduced to these if it is pertinent to their research.